I’ve already wrote some notes about Rock N’Road in this post. Whilst I really like how this drama doesn’t just concentrate on romantic relationships, and I wouldn’t classify as ‘just ANOTHER Taiwanese rom-com’, I just haven’t been very motivated to watch many episodes in a row. Since there was no new episode last week (due to the HITO Music Awards), I hope to write a quick post on these eps so I can keep watching! Cannot be missed! Two scenes in particular were very memorable…. To be honest I think the weakest link in Rock N’Road is ‘hyper Wei-Zhen’. Sure, there are others who are not the strongest actors (eg. Jia Xin aka Nita Lei) but as the lead character who will go through a rough journey, Wei Zhen really needs to win over the audience. At that point in time it was really hard for me to understand why she was always so hyper, and kept wondering why she had no sense of understanding of the real world. This scene explains a lot of it. Shu Yu: I really don’t know whether you’re an idiot or naive. Can’t you take care and protect yourself a bit more? Wei Zhen: What can I do? I only know I have to keep smiling during adversities. I don’t know what to do. You don’t think I’m upset that my dad’s song was sung by someone else? You don’t think I’m scared being chased by the paparazzi? I won’t feel any pain when others throw eggs and paint at me? I just don’t know what I did wrong. Fine, you tell me. Even when I smile, it’s wrong. What can I do? What did I do wrong? Tell me! It does make her a lot more sympathetic although I still have nagging questions over it. Plus, in the future episodes she does continue to act in her hyper ways which still baffle my mind. At least it’s happening less often now so it’s becoming more tolerable. I think I mentioned in my last Rock N’Road post that the actor who plays Li Da (Mike Lee) tends to mumble. But in this scene, he was absolutely clear. There was a bit of overacting in there but from this point onwards, I think Mike Lee’s portrayal is getting better and better. Li Da: Zhou Shu Yu. Why did you have to do this to me? If you don’t want to support me, you don’t have to pretend you’re my brother. For the past 8 years, there has only been you, Zhou Shu Yu, Director Zhou who is allowed to be selfish and have a bad temper. Everyone has to tolerate it because you’re the music genius and we’re the idiots. We’re the stupid ones. I guess a lot has to do with his character. In the beginning, he was always in the shadows, supporting Jia Xin and Shu Yu but once he decided that he can’t live in the background anymore, he’s becoming a more assertive, confident character. Normally, this would be a positive thing but his intentions are probably not the most noble. It’s win at all costs for him and Jia XIn. Facing a turning point in his career, Shu Yu was disappointed in Li Da, how he could just abandon their years of friendship and team work to chase fame and fortune. For Shu Yu, making music should come from the heart, without all the extras like creating news for the gossip magazines and fancy promotion tactics because good music should sell itself. 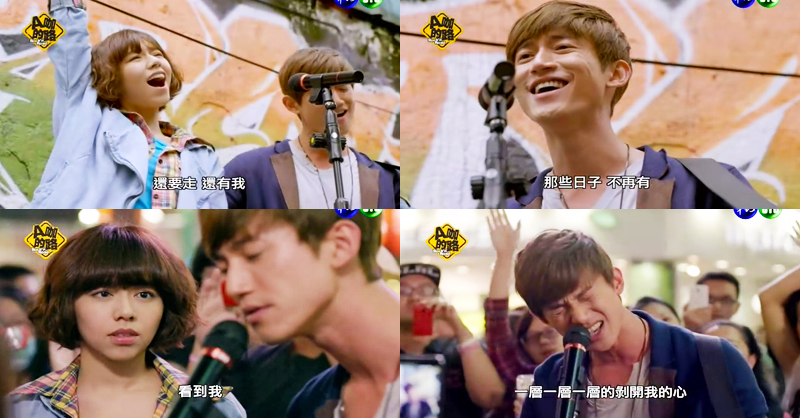 So going back to his roots, Wei Zhen and him ended up just singing on the streets and that’s when he realised what he wants in life. Just something simple. Making music he is passionate about. Shu Yu: Sometimes you only need a guitar and a voice to face the whole world. That’s the most interesting thing about music. I do love how Chris Wu sang ‘Onion’ in this scene and (except the chorus onwards) we finally get to hear his voice!!! He sings pretty well by the way and I originally thought he didn’t sing the chorus because the notes were probably too high, but he sang a bit of it during a Behind the Scenes clip and he COULD sing it! We probably all know Jia Xin was never going to accept this proposal. If she accepted, how can the potential romance between Shu Yu and Wei Zhen move forward? Rock N’Road has taken half of its episode count to get to this point and it really was just the nail on the coffin, a complete sever of the ties between Shu Yu and Li Da/Jia Xin. Jia Xin made her choice. She could not give up everything she worked so hard for to go back to a life of simplicity. Maybe she just didn’t love Shu Yu enough. She must know life at the top can’t last forever (unless you’re Andy Lau I suppose). I wasn’t really sure what Shu Yu was thinking, for the last few episodes we see less of the interactions between him and Jia Xin as he spends a lot more time with Wei Zhen. Did he truly think that Jia Xin was going to just leave BS with him and start a new life together? Shu Yu: I know leaving BS was upsetting for you. But it allowed me to think about how my (our?) life had been for the past few years. I don’t like the entertainment industry. I just want a simple life. I just want to make music. Then we can just walk freely on the streets, holding hands… I can hug you when I want, kiss you when I want. Live just like an ordinary person. Jia Xin: Shu Yu, I’m sorry. I can’t leave BS. I can’t throw away everything I have now. I can’t lose the audience’s applause. I can’t lose the fans’ love for me. You can understand, right? You know how much I have given up for this. This goes back to my single issue with Shu Yu. I love watching him but he’s so focused on what he wants to do and isn’t aware or interested in anyone else around him. In short, it’s ALL ABOUT HIM. Maybe instead of just being all ‘full steam ahead’ on the music HE wants to write, on the theme HE wants to concentrate on and in the timeframe HE dictates, if he even stopped for a moment to think about all the other people around him he would’ve realised things have changed. I admire that he has a dream and sticks to it, but the story doesn’t seem to acknowledge that this is an area Shu Yu could work on. Just though I’d mention it was weird that Wei Zhen was hiding behind the sofa in this scene though. Like… it’s an emotional scene that should just focus on Shu Yu and Jia Xin. I didn’t really want to see Wei Zhen making faces which was distracting. The beginning of episode 8 was really enjoyable because it’s like Wei Zhen and Shu Yu got to take a break from all the crazy and start reflecting on their journey so far. 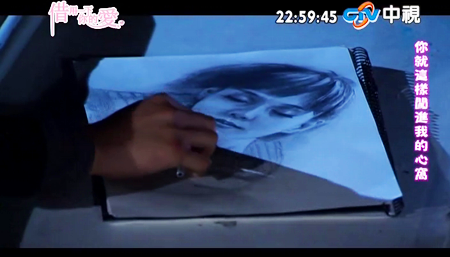 Shu Yu is supposedly nursing a heartbreak, but he didn’t look that sad over Jia Xin dumping him. Surely he also felt the proposal was a last ditch effort? In his heart, he already know Jia Xin had changed but didn’t want to face it until now. Anyway, with their short break over at all the hot springs hotel (?) that Wei Zhen’s mum owns, the wise mama also notices her daughter’s growing feelings for Shu Yu. Wei Zhen dismisses it as fangirling. She views Shu Yu as her idol, not her boyfriend. After overhearing the mother/daughter conversation and Wei Zhen trying very hard to cheer up Shu Yu, he pretty much flat out asked whether Wei Zhen likes him. Shu Yu: Do you really like me? Wei Zhen: Are you crazy? I’ve already explained so many times. The way I feel about you is like a fan towards their idol. Idolise and like are different things! Crazy. It was all fairly light hearted though, saying they’re joking. But instead of treating her like some weird alien from outer space he can’t understand, I just get the feeling they’re growing more comfortable around each other as friends, rather than Director/employee. At the moment whilst I do enjoy their interactions (when Wei Zhen is not hyper!) I’m only getting more of a friends vibe between Shu Yu and Wei Zhen. But I am looking forward to seeing them grow even closer together. Yeah… as long as we keep it to once per episode, I think I can live with it LOL. Guess WZ just ‘happened’ to be there because she was helping SY with the decorations. But there should’ve just been a clean break between Shu Yu and Jia Xin. 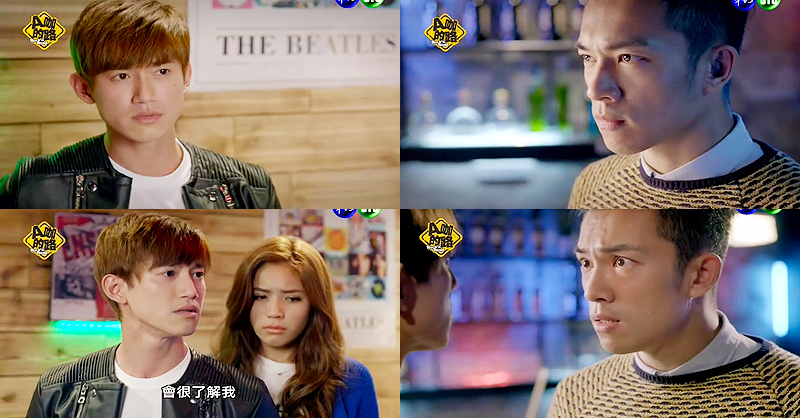 It was so awkward when Jia Xin sees Wei Zhen there… she will always think Shu Yu left her because of WZ.